A. It was the desire to love my voice that brought me to Vocal Awareness. I didn’t love my voice and I was at a point where I could see, if I was going to be the person that I knew I wanted to be with the attention I wanted to have, I felt instinctively that I needed to grow my voice up. Vocal Awareness gave me access to “growing my voice up” to the woman that I am today. I had heard about Vocal Awareness through a girlfriend. It was simply a coincidence, because I hadn’t put it out there that I was looking for something. The desire to love my voice had been riding in the back of my mind for 20 odd years, really a long time. 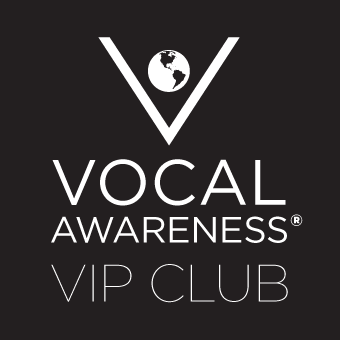 And, my girlfriend just happened to say, “There’s this course going on and it’s something you might want to jump into because it just sounds a lot like you.” I talked with somebody from Vocal Awareness and signed up. That’s when I first met Arthur. I was sitting in the front row and it felt like he was speaking directly to me. I just looked at him and I was bowled over by the straightness of Arthur being Arthur and the authenticity he brings to his Work and working with people. I was very emotional at first and it really hit me here in my sternum. Like, Whoa, who is this person I just met! He was not messing around. There is an emotionality to us human beings that our voice betrays—and that was the little girl in me that hadn’t grown up. In doing the Work, practicing, my voice is finally growing up with me. My Voice is quite different now. A. There have been several shifts. Honestly, it’s like going to college. It really is. There is freshman year, sophomore year, junior, senior when there is development—development of the Self. One moment I can really say was a major shift was learning to slow down and make eye contact. That was huge for me. I wasn’t sure that people wanted to hear what I had to say and I wasn’t too sure that I could look at their face and get the feedback. What if they didn’t like me? What if they didn’t like what I was saying? Actually, because I had this self-defeating other conversation going on in my head, I could barely hear them while I was in a conversation with them. Arthur’s Work helped me learn to slow down and make eye contact and stay present for me. This led to a stronger sense of who I am and what I have to say. It’s okay and, like it or not like it, my vision is not going to change. It’s what I came here to be and do. So, I might as well say it in a way that is comfortable for me, make connections with people and see what happens. That’s really a major shift for me because of Arthur’s Work. A. I would say that the greatest benefit my Vocal Awareness practice has given me is how I now embody my Vision. They are not separate. It is not, oh, Stephanie has an idea. Here it is over here but there is Stephanie over there… They don’t match. Now, it’s like this: They match. The crux of it is that that embodiment allows me to make the contribution I came here to be.